Panicled hydrangea (Hydrangea paniculata): growing, planting, caring. 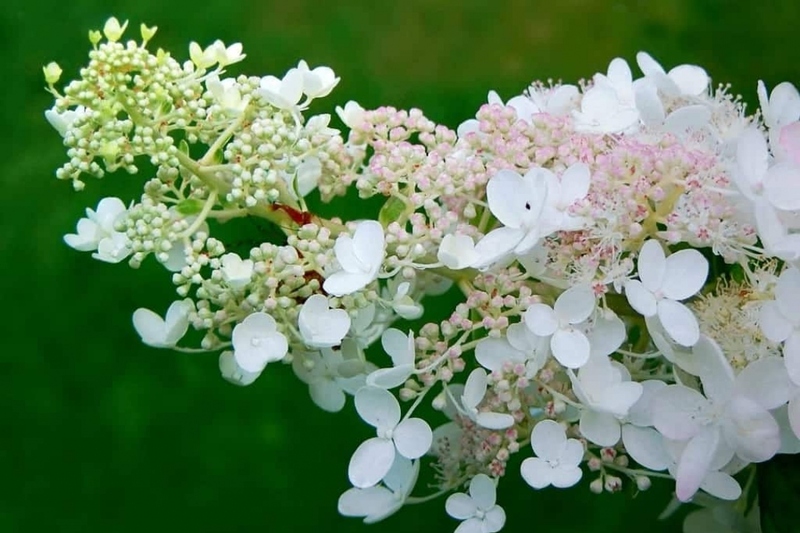 Hydrangea paniculata - the panicled hydrangea - is a species of flowering plant in the family Hydrangeaceae, native to southern and eastern China where it grows in sparse forests or thickets in valleys or on mountain slopes. It is a deciduous shrub or small tree, 1–5 m (3.3–16.4 ft) tall by 2.5 m (8 ft) broad, with leaves broadly oval, toothed and 7–15 cm (3–6 in) long, and large conical panicles of creamy white flowers, with florets an open pale green grading to white with age. Numerous cultivars have been developed for ornamental use. Panicled hydrangea enjoys slightly acidic soils, like its cousin, but won't make a drama of it, and just dreads slightly heavy soils. Plant it in April or early fall. The hydrangea accepts a semi-shaded or sunny exposure - the more sunshine, the prettiest colors will be in autumn! Gently remove it from its pot, and put the root ball in a bucket of water to re-hydrate the plant. Dig a large hole, about half a meter, then crumble the soil you have removed and mix it with potting soil and sand if possible. Throw some organic fertilizer at the bottom of the hole, and arrange your plant in the middle of the hole, taking care to spread the roots. Then fill the hole with potting soil, tamp lightly, and water abundantly! For seedlings, the first two years, and in the coldest areas, protect the roots with mulching, made of wood, or dead leaves. In spring, a compost bed will suffice. Water by major contributions, in spring and summer the first year. For young plants, you can provide small hollows at the base of shrubs, then spread a mulch layer 10 cm thick. In the spring, water in the morning and in summer, in the evening, when the sun is down. You can bring a bit of heathsoil on the topsoil in the spring, or make simple inputs of potash from time to time by spreading ashes of wood. Cut the faded inflorescences at the end of the winter and if necessary, prune the branches by a half to maintain an elegant and compact habit. The hydrangea flowers on the new wood, the pruning done at the end of winter will not stop flowering. Be careful, in hot and humid weather, white felting on the underside of leaves may reveal an oidium attack. Regular foliage spray with a mixture of water and skim milk often eradicates this fungus. Mix 50 centilitres of milk with 4 liters of water and spray weekly. Use preferably skimmed or semi-skimmed milk to avoid the odors of decomposition of milk fat.